Yesterday I got a call from a teacher group in District 22 - advising me that I officially had their endorsement in the GOP primary. What an honor. There are over 5,000 teachers in Ft. Bend county alone, enough to win this primary outright. “Teachers are our future. They were hurt when the incumbent cut their pensions in 2004. That hurts teachers and that hurts our children. And that hurts our future as a country. I have been an Adjunct Professor. We are in a global economy and need a first class education system to compete in the 21st century. I will work hard for teachers as well as veterans, small business, the elderly, and our kids. The Bottom line: Without teachers, we have NO FUTURE as a country or world leader. When you hurt them, you hurt our future prosperity. Mr. DeLay cut their pensions the same time he allowed himself a fat pay raise. I would give the teachers their pensions back and stop Congress pay raises until the budget gets back to being sane and fiscally fit. Stop spending billions on bridges to no where. America needs to become "Fjiscally Fjit" in Viking speak. I'm back out there, finishing what I started on this mission to get Congress away from the corrupt and working for our future. Reports are that the turnout is LOW – Pearland box has only had 400 voters after a week of early voting! This is good news for me. Low turnouts favor a challenger who already has a proven grass roots base, as I have from three prior election cycles. It is bad news for the new challengers because they don’t have a base. I talked to a friend running for office in Brazoria County today. He said that people were seeing my opponents’ signs and were asking him “Who are those people?” Does that sound like they will be getting those votes? The media doesn’t understand that you just can’t buy votes in a primary with signs and ads—that may work in a general election but not a primary. People want to know who they are voting for. The media assume money equals votes but it is grass roots work that produces primary votes –years of time meeting people and shaking hands. I’ve seen challengers drop millions and lose out to grass roots with less money (Ref: Wareing vs. Culbertson in District 7). P.S. A major new endorsement will be announced tomorrow (Feb. 28). Standby or check our Press Room. It comes from a group who were hammered by the incumbent. They are part of a group with over 10,000 voters in the district. That is enough to win this outright without a run off. Amazing. That was twice in two days kids have said that. My wife’s statement about the “Weekly Reader” poll – where kids have been right about who will be the next President for decades – rang in my mind. Perhaps they have the advantage of being able to judge things without personal interest interfering with their judgment ! All I need to win is for my voters from either the 2002 or 2004 election to get just 2 of their friends to vote for me -- and I win this outright without a run off with a 22 year incumbent. This is the Chinese year of the Dog. It could also be the year of the dark horse and the underdog. That certainly describes me. "We are not voting for Mr. DeLay this year. Instead, we are voting for you because the other guy (meaning Mr. Campbell) has too much political time in Washington already. We want you because you haven't been tainted by it already." Amazing. I have met a lot of people like that –people who used to vote for the incumbent but have said they won’t do it this time. When I drove home to get Laura before the last candidate forum, several kids I didn’t know were in front of our driveway, doing whatever kids do. As I pulled up I rolled down the window and said: “Who’s winning?” meaning which one of them had won whatever game they were up to. I liked that kid. It reminded Laura of the “Weekly Reader” poll, where kids pick the next President and are usually right. We’ll see if they are right this time. I know this. If every person who voted for me in the last three elections get only 2 friends to vote for me, I win this one without even a runoff. I ask they get at least 5! We had a GOP ladies candidate forum at a beautiful setting in the Southern National Bank of Sugar Land last night, which was covered by NPR for its national radio network (to be broadcast Monday, Feb 27 on its morning edition), using tape from the event. Mr. DeLay did not show and did not bother sending a representative -- a dinner in Dallas outside his district was so important that it required him and his entire staff, instead of at least sending his very capable stand-in Chris Holman to the ladies forum in the district. DeLay had the moderator read a letter to the candidates and ladies groups from him! What a total disregard and slap at the ladies, in my opinion. As Congressman, I would have appeared personally to the ladies in the district and sent my rep to Senator Kay’s dinner in Dallas. DeLay missed a great group. Only Mr. Campbell and I came. The format allowed, for the first time, each candidate to ask the other candidates one question. Is that why DeLay wouldn’t come? We both agreed that DeLay is finished. I’ve been saying it a lot longer because the problems have been evident for years. The Scotland trip, Abramoff, etc all occurred since 2000! I have been reaching out to the people of the since 2000 to make this long overdue change. The budget is a mess, security was zilch before 9 11, lobby money still fuels his campaign and buys our representatives vote -- things remain the same! 22 years is too long in any office. I thank the ladies who held the forum, and NPR for covering the most important election in 2006 (as someone has called it). Despite that, no Houston TV and radio media were present last night -- just NPR, doing the public a tremendous service. Tune in Monday for information you aren't getting locally. The local TV/radio media are missing the news event of the century in the making. My wife said she saw the looks on people’s faces last night –they are finally realizing DeLay’s days are over. The other candidates for other offices waiting to speak could hear it in the room. Ask them.The only issue now is to which candidate to turn. DeLay himself must have realized it Friday night when his presentation fell flat in front of a group representing thousands of voters. 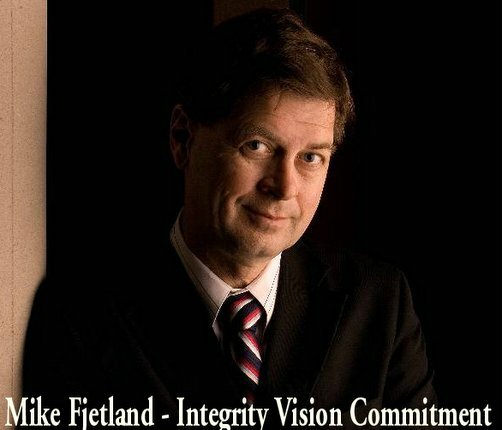 I ask you to get out and vote for the one candidate who has been out there challenging corruption at its peak, instead of waiting until DeLay was weak…Mike Fjetland. No late tackle hits here. I’ve been part of the process to take down this corruption for a long time. Do you vote for the ones who waited to join the fray late? -- or the one who has been battling it with determination and commitment and with district people for the last 3 elections in which I was kicked off the ballot, had highway signs stolen and was shut out from the media by Mr. DeLay? Yes, I am the underdog here, but I'm also the only one who has worked like a dog for the district for years, challenging the incumbent when he blocked transit upgrades and veterans benefits and teachers pensions. Who has been the most reliable in fighting for you and clean, honest government? Why are they just getting into it now, when it has been evident for a long time? I challenged wrong when it was at its peak, not waiting for when he was weak. Who do you want in office now? Ask yourself --then go vote and get your friends to do the same. Thank you! Campaigning does have its advantages, aside from long hours. Last night I got to meet "Miss Texas USA" Lauren Lanning at a Masonic Lodge, which even included dinner. I didn't expect either. I can tell you that Texas will definitely win the “Miss USA” crown this year. Her mom was with her. I thought they were sisters. We witnessed a Mason get a 50-year award. He came with his wife of 69 years. It was great.Early voting starts today. I ask for your vote. I’ve spent many years in this district talking to people, getting ready for this time. I’ve fought for teachers and vets, commuter rail, small business and justice and fairness. The other challengers have never run before and have no proven voter base. I have a base of 5,000 plus from prior elections, which guarantees me a run off spot at the least in the primary. Last night it expanded by at least one to include Miss Texas USA, who lives in the Friendswood part of the district. She and her mom certainly get my vote. Please tell your friends to vote today for a 21st Century rep with integrity, a local focus and the global skills we need in DC. Yesterday we had two candidate forums. A clear sign of trouble for the incumbent is that he personally appeared at both. The second forum was his very first step inside the Arab Community center in Stafford in the 5 plus years of its existence. DeLay said he believed in the primary process but he didn’t tell them he had me bumped from the primary ballot in 2002 when I turned in signatures instead of paying an expensive filing fee. I didn’t mention it to the ladies – it’s water under the bridge. Let’s move on to the future. The second forum was last night at the Arab Community Center. It was great. My wife Laura and I had a wonderful time. We saw a lot of old friends and made new ones. It’s too bad the TV cameras weren’t there because I felt a real surge of energy in the room as I talked about American values like justice, fairness and equality. I talked about one Arab American man who applied for citizenship after 11 years of marriage – and the INS took his passport, checkbook and photo of him with Mayor Bill White! What? A terrorist is going to have his photo taken with the Mayor? Another candidate said that his 15-year-old son is on the no-fly list. We read about two year olds are having the same problem with airport security and no one has shoes. Homeland Security under the incumbent is not making sense. I learned that it was Mr. DeLay’s first time at ACC. I’d been there every time as a candidate since 2000, as well as Jewish Temples, Indian temples, Chinese, Vietnamese Hispanic and African American churches, etc and some churches that I am not sure what they were. The community center has always been full of normal Americans with family values who believe in the American way and our Constitution - even more so than some of our politicians! One question was raised about torture. I said that America must improve its global image. We are a nation based on courts and laws, not flying people to countries to be tortured. Even Mr. DeLay deserves a day in court rather than being dragged to a foreign country and tortured (don’t even think it). If our court system is good enough for him, indicted on a felony, then it is good enough for everyone else in the world. A couple members of the media I talked to yesterday caught the humor in the idea of adding an old fashioned Olympic challenge to this election. One laughed and asked: "Are you in training?" Sure. But come to think of it, DeLay would go into an arm wrestling tie breaker with an advantage - he has lots of practice strong arming lobbyists! But pocketing plump lobby checks doesn't generate a lot of muscle tone, so my five years of grass roots "working out" and "training" in the district should be enough to pin him in the deciding match. :0). Mr. DeLay needs to be pinned down to the truth when he tells his own constituents two different stories on whether he is "best friends" or a stranger to a man he took several international trips with to exclusive resorts in Scotland and the Marianna Islands. His own words prove he plays loose with the truth as well as the people's money. His cuts in teachers' pensions and vet's benefits while allowing “bridges to nowhere” are acts he pinned all by himself. Hurting teachers hurts our children and our country's future. I would not send vets to war in Iraq than vote 'no' to $50 million in improving artificial limbs for the injured coming back. What about the other challengers in this contest? One question. WHERE were they the last 5 years when all DeLay’s lobby trips, money laundering, etc was taking place? I was out here fighting corrupt politics and working for the regular people in the district instead of making the big bucks for Fortune 500 companies. I was working to earn votes, not buy them. What is their real agenda? Mine has been public for 5 years. All are claiming to be more right than the others--all splitting up that vote. I am the only declared moderate with a proven base. Voters have the power and growing desire to strong arm some change on March 7 - if not then they will allow corruption and deceit to masquerade as honesty and integrity in Washington. So if we can’t have a mature TV debate to educate voters, perhaps the American way is that we have a TV arm-wrestling match instead! With the sniping going on in Congressional candidate press releases and candidate forums (not me of course), and since the winter games are going on, I propose that consider settling this contest in Olympic style – with a twist. My three would be (1) Golf, (2) Flying mock air combat from that fighter place in Galveston –which uses lasers not bullets, and (3) arm wrestling. The winner of 2 of 3 against DeLay wins. It would shake out like this. I’ll lose the golf match because I have been in 55 plus countries and have never played golf in any of them, so DeLay will win that one, especially if it was held in Scotland. Ummm. As a pilot and former Captain in the Civil Air Patrol on homeland security patrols, I will blitz DeLay in the air to air combat with the Galveston flight. He’ll be in flames (like our Homeland security status) before he can toss his cookies in a loop. So it would boil down to the arm wrestling. I can feel the surge of energy I would have at that moment, grabbing him by the arm while thinking about his cutting funding for missing limbs of our Iraq vets and teacher pensions guarantees -- while approving the bridge to nowhere. I’ll pin him on those without even thinking about the confusing prescription rug plan he devised that cheats grandma if she tries to change it. But it won’t happen. Mr. DeLay is afraid of a TV Debate, not to mention arm wrestling and air duels (but not golf). Someone has said, rightly I think, that this is the most important election this year. Should not people know where everyone stands? What is better than like in a democracy than an unscripted TV Debate for the most important election of the year…..? So which DeLay statement is true –that Abramoff is a “close friend” of DeLay’s or that DeLay “didn’t know Abramoff” as he now claims. Mr. DeLay has said both, meaning one of them is false. He started with: "Jack Abramoff is a close friend of mine" on national TV. Did you see it? Then after Abramoff pleads guilty, DeLay sends out an 8-page letter to his constituents, saying he "didn't know Abramoff." EIGHT pages? A lot of trees had to die to make his case. Ummm. So, which statement is true Tom? How can anyone believe DeLay’s answer to any question when one of these statements is obviously a bold lie (what else?) since the statements were both made by him and are contradictory? In his own words, DeLay has proved that truth is optional in his office. The Chronicle Sunday article on this election claims: “GOP voters still Like DeLay” http://chron.com/disp/story.mpl/metropolitan/3653114.html but do the math. The Chron poll showed nearly 50% of the voters were UNDECIDED. It also gave the three challengers about 10%. If half are undecided and another 10% already want someone else, that puts DeLay at 40%! That is below 51% needed for an outright win. That is not strong support --it is called a run off! Consider that he got 80% in 2002. So anything below that is a loss for him. It means that as the undecided voters split their votes, DeLay will end up with even less than 40% on March 7. My advisors estimate his actual base is about 35%, mostly in Sugar Land, the venue observed by the Chronicle. If DeLay does somehow win March 7 or the run off, the seat will go to Democrat Nick Lampson -- who is already outpolling DeLay in a 60% GOP district! The Chronicle article takes a shot at me, saying “the most he’s ever received in prior elections is 20%.” That’s good! Fact – That 20% equals 5,000 more votes than the two new challengers have ever received against DeLay –in a district that changed boundaries three times and could change again since the US Supreme Court is hearing it on March 1! The other two challengers start with zero base since they have no prior history in this district. I have spent five (5) years and several pair of shoes in face time. That personal loyalty by people who always vote -- but don’t show up in the Chron's random poll of a few people. So I go into this election with at least 5,000 voters I can count (the second largest to DeLay's) versus zero for the other challengers. They are trying to buy the votes that I have been earning. They do have the bigger budgets, but mine comes from local people, not national or personal special interests. Bottom Line: This race is still wide open. That also means that I’m probably the closest to DeLay for the No. 2 run off spot with my base from the last three elections. It would not take much to surpass DeLay when 40% are still undecided! The other challengers may try to buy votes this time, but I have worked to earn my votes. I thank everyone who has voted for me since 2000. The Chronicle says they “see no groundswell” for me. They should have been with me last week in a church when I was talking to a couple people, and was suddenly surrounded by people -- all talking at once -- excited to see this Congress candidate. It happened in several places. It didn’t happen at the Sugar Land chamber but that is a small part of the district that covers four counties. Some of those people would vote for DeLay no matter what. The Chronicle also flogged me for “talking too long to a constituent.” I can live with that. I am there to listen to them regardless of how long it takes. I try to talk to everyone. The real question is who is best to take his place? I still say we need a global Congress rep with experience and integrity to deal with an increasingly dangerous, global world. WASHINGTON (Feb. 9) - A group of 85 evangelical Christian leaders on Wednesday backed legislation opposed by the White House to cut carbon dioxide emissions, kicking off a campaign to mobilize religious conservatives to combat global warming. I join them in their mission. Without cutting emissions we jeopardize our entire global environment. Did those who think we can ignore melting ice caps which planet they plan to move to when this one is a wreck? Right. This isn’t like moving to the other side of the tracks if your neighborhood goes bad. If the planet overheats, we all lose. So I agree with these church leaders in their quest. On the campaign trail, we had a candidate forum in Needville last night – No DeLay, although he appeared in Sugar Land on Monday. I guess Needville doesn't rank with him, but it does with me. We discovered the best seafood restaurant next to the KC Hall. When we went inside, we found several other candidates gobbling away. LOL. An editor contacted me today, asking me about DeLay’s 8 page letter claiming he and Jack Abramoff “weren’t friends” despite two international trips to exotic resorts and Jack pulling out the credit card to pick up Congressman’s expenses. All I can say about that is this. If you believe that strangers do that kind of thing, I’ve got a bridge in Brooklyn I’d like to sell you…! News just reported that Houston Metro won't get its $324 million this year for rail expansion to new lines, like Ft Bend and Clear Lake. This is on top of losing Ellington Field, a blow to our homeland security. This happened under DeLay’s watch. He’s been a Congressman on the public payroll for 22 years and we can’t get a measly $300 million for helping our overcrowded roads by expanding our commuter rail transportation? Unfortunately, he’s been working to kill rail for years. I heard him tell a Rose Rich chamber group that the Dallas rail system was a total failure. Never mind that it was a total lie. Now he is ignoring to death as we commuters sit stuck in traffic for hours. Ellington Field was shut down despite DeLay being its Congressman. It’s F-16’s are leaving. As a terrorism expert who was on TV on 9 11, I believe we are a prime target. That is not power. That is pitiful. We could do better with Mary Poppins in his seat, not to mention any of the challengers. It wouldn’t take much to do better. I guess he was too focused on lobbyists in DC to see it coming. Since 2000, I have seen Mr. DeLay appear at a candidate forum a total of three times - once when I filed in 2000, once at the Clear Lake debate in 2004 -- and last Tuesday in Ft Bend at a chamber forum. It means he smells trouble in the Bayou City. Polls say that if the election were held today, he’d lose to the Democrat. The trouble with a candidate forum is that everyone says how wonderful we each are in 2 minutes and there is little the public gets about where we are on the issues and our vision for the future. All I recall DeLay saying in his 2 minutes was how much he hated Democrats. That is a thin platformto stand on. I didn’t hear his vision for dealing with border security, runway spending, $18 billion in pork barrel earmarks, etc. This election needs to be about our candidates’ vision for the future. Only a real debate between us before March 7 will give the public that knowledge. All the public is getting now is signs, mailings and emails saying how wonderful we each are. That is ok but not really useful to the public. For example, if I had been in Congress the last six years, we would have already finished the Ft Bend commuter rail extension from Rosenberg to the southern terminus of Houston’s rail line. That would take 50,000 cars off the road as people went to the Medical Center and downtown. On weekends Houstonians could enjoy “day trips” at the antique shops and restaurants in historic downtown Rosenberg and Richmond. It would boost the economy and give Houston another part of history to enjoy. I’ve fought for this improvement since running for this seat in 2000. In those six years I did not see the other two challengers out there fighting for it. They were making the big bucks certainly, and they can use them in this race, while I was out there taking a pay cut by running for office to fight for better transportation and other services for the district at a time when DeLay was diverting hundreds of millions of our federal dollars to other cities. And it took these new candidates to 2006 to get riled up about these things? I’ve been fighting for the vets all these years as well. One vet told me how he heard Mr DeLay claim he'd close every VA hospital in the country if it were up to him. I disagree with that view. I would have voted for the vets instead of voting down $50 million for prosthesis research for our veterans returning from Iraq with missing arms and legs, as DeLay did recently. I would have voted for the vets and against the bridge to nowhere. He did the opposite. On the teacher front, I was with them in 2004 when they got hammered on their pensions by Mr. DeLay. I would reverse what he did to teachers. By cutting their pensions he cost us to lose years of talent and our best and brightest, who were forced to retire early. I was out there with the teachers in 2004 as a candidate, fighting for them. Where were my competitors? The public needs to know this. One lady said to me yesterday: “This is one of the most important elections of our time.” She’s right. So why not serve the public by having a debate to talk about all these things that will impact all of us? What do YOU think? Iran is on course to build a nuclear weapon. The key question for the U.S. is how to handle this dangerous situation. I was supposed to be in Iran in 1978 on a project for a Fortune 500 company. It was a naval base being built on the Persian Gulf. I avoided being a refugee and potential hostage when I turned down that assignment and took a job with another Houston company as an international attorney. I ended doing oil deals in places like Cairo, Egypt and negotiating pollution control technology in Beijing, China instead of being put on a barge and fleeing one step ahead of the 1978 Iranian revolutionaries. The new Iranian President is one of them. Iran is an example of what happens when a radical religious agenda takes over from a secular government. The fanatics have sidelined the moderates in Iran. We’ve had enough extremists in our own government. All they do is get us into trouble. The key is to help Iran reach a more tolerant, moderate government. You can’t do that with a war. Iraq should be a lesson in how our assumptions don't match reality in these situations. Iran's facilities are underground. Iran already has missiles that can hit Israel and radioactive material that could be used as a dirty bomb in a warhead. The payback from a military strike would be deadly to our allies. It will take global diplomacy and strong pressure to resolve the Iran situation. The U.S. should call a summit and involve NATO, Russia and China. I spent the day of 9 11 on TV as a terrorism expert. We don’t need any more of them. On the campaign front, I had some incredible experiences over the weekend. I went into one place yesterday and was talking to a couple people. Before I knew it, a dozen people had surrounded me –all of them taking excitedly about the election. The desire for change was so thick you could almost cut it with a knife. I leaned against the wall, and listened. Voters need to be thinking about which replacement representative is best equipped to deal with the looming local and global issues facing us – from teachers and vets getting better treatment to dealing with Iran’s fanatic government on a quest for nuclear weapons. The skills we need in Congress for these global situations are not acquired by playing golf at expensive resorts in Scotland…If a representative doesn’t have those skills now, he or she won’t have the time to get them on the job to avoid making some big mistakes in dealing with these complex global issues that affect our security. That knowledge could have avoided a lot of mistakes made with Iraq. How would Christians react if someone portrayed Jesus as Mohammad was in a recent cartoon in Europe? That's right, they would be rightfully outraged. It is time that people realize that we need to treat ALL religions with respect. That is what America is supposed to be about and that is what our representatives are supposed to do - treat them equally and with respect. If a terrorist hijacks a religion, it is not the religions fault, it is the terrorists fault. Last week I went to a Mosque in Ft. Bend and I heard a message of peace, and of the importance of being honest and good. It could have been the sermon in my church. I have heard many like this in Houston Mosques since 2000. I have attended Jewish temples, Indian temples, and many others in this diverse district. All deserve respect. The cartoon was really religious racism, and that is wrong. A Congress rep should be thinking how global events affect our future, because they do. So the election of HAMAS deserves comment. If it increases terrorism, then it directly impacts our Homeland Security (and future terrorism acts here or abroad). Our mission is to find a way to diminish that threat. There is a way to do that. “Fixing it” means promoting secular, progressive groups in the Middle East that provide an alternative to hard-line religious radicalism that fueled HAMAS. Unlike Arafat and his Fatah, HAMAS actually built hospitals and provided services that the corrupt Fatah officials never tried to do. But they will have to accept Israel’s right to exist. Our government can play a role in the process of moderating Middle East politics. President Bush, as Mr. Zakaria points out, has said that democracy promotion is a “growth industry.” We can help by funding those groups to help bring electoral diversity and more moderation to the Middle East. I have talked about this issue with both Muslim friends and Jewish friends. Everyone has much at stake because it impacts all of us regardless of religion or where we live. We must be proactive to avoid future 9 11’s (not to mention budget crisis) instead of ignoring the obvious signs as our Congress did the 1990’s.